The Sony Xperia miro runs Android 4.0 out of box, just like most of the Xperia smartphones we have reviewed recently. The interface is still covered head to toe by the custom skin that Sony used to style Android ever since Gingerbread. The Sony Xperia miro has the usual five-pane homescreen configuration, without an option to add or remove panes. There are four docked shortcuts (two on either side of the launcher shortcut). These are visible on all five homescreen panes and are user configurable: they can be either single icons or folders with multiple items in them. Speaking of folders, one of the differences is that they're now displayed a bit differently - they show thumbnails of the first four items in them. Not a major change, but gives you quick peek of what's inside. The homescreen does a neat trick called Overview mode. Pinch to zoom out on any of the 5 homescreen panes and a new screen opens up with a cool transition. All active widgets are displayed in a type of floating cloud, and selecting one takes you to the homescreen where that widget is located. 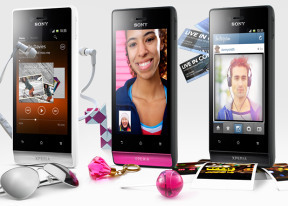 The Xperia miro has some custom-made Sony widgets in addition to the standard set. Those include the Timescape widget (alongside its dedicated app) and a Mediascape-like widget for photos and videos (the actual app isn't there anymore, the standard gallery is back). Adding a widget is done through a special scrollable interface which displays all available widgets. To browse through them, you have to scroll up or down and tap on the one you want, which places it on your currently selected homescreen. To remove it, simply hold and drag the widget to the trashcan icon which appears on the bottom of the screen. The widget selector can be a little tedious if you're trying to go to a specific widget, but is a great way to see what you have available to you. A cool new addition to the lockscreen missing from Xperia phones of old is the music player widget, which lets you control music playback without unlocking the phone. You can also enable Face, Pattern, PIN or Password unlock, in ascending order of security. The standard notification area is present and accounted for, although for some reason it isn't accessible from the lockscreen as it usually is on ICS (and on other ICS-running Xperia phones). The Sony Xperia miro is powered by a lowly Qualcomm MSM7225A processor with a single Cortex-A5 core clocked at 800 MHz, 512 MB worth of RAM while graphics are handled by a dusty Adreno 200 GPU. So the results you should expect from the Xperia miro are nothing special. First up is BenchmarkPi, which tests the CPU's calculation power, and has little love for multi-core processors. Still, due to its Cortex-A5 architecture and modest clock speed, the Xperia miro posted a pretty poor score here. AnTuTu gives the smartphone an all-round grade for processing (calculative and graphic, memory speed, SD card writing, etc). We don't have the scores of the Xperia miro peers here, so we could only compare it to way more expensive offerings and it's little surprise that it came last. Linpack is another processor test and once again we found the miro trailing far behind its brother in arms the tipo. BrowserMark throws HTML5 into the mix, to see how future-proof the miro is. Scoring a top three spot for itself, the miro really shines in the budget class. Nenamark 2 is our graphics benchmark. The miro scores a lowly 16 frames per second, suggesting it won't win "The Gamer's favorite" award this year. Backed up by Android ICS, the Xperia miro is reasonably smooth in everyday usage. The occasional lag is there, but the overall experience isn't bad at all. The chipset is way less powerful than higher-end smartphones and no amount of optimization can hide that fact.